Competency-Based Education (CBE) is a learning-centered model that gives students a more direct, flexible pathway to completing a college degree, allowing them to attain mastery at their own pace. By clearly defining measurable learning objectives, or competencies, and specific ways to demonstrate mastery of those objectives, students are provided with new ways to achieve results. A focus on learning outcomes and competency mastery can be beneficial for any educational program, and programs that are not dependent on “seat time” scheduling are particularly helpful for students who have prior learning, need to stop and start as they progress, or who need more or less time than average to achieve learning outcomes. 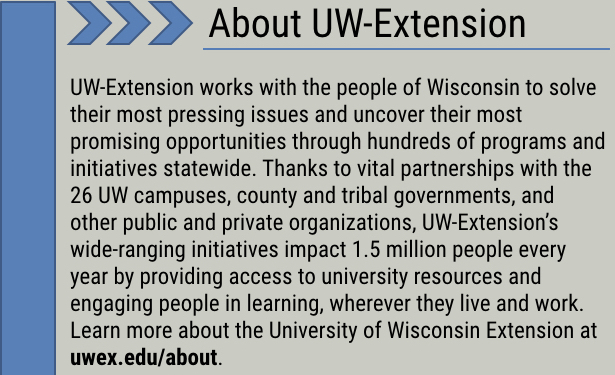 At the University of Wisconsin Extension (UW-Extension), the mission is to “provide statewide access to university resources and research so the people of Wisconsin can learn, grow and succeed at all stages of life.”1 In order to achieve its mission, UW-Extension has implemented the Wisconsin Idea, which is broadening the “boundary of the university to the boundary of the state”1 in some revolutionary new ways. A goal of these continuing education outreach programs is to give non-traditional students access to higher education opportunities. David Schejbal, Continuing Education, Outreach & E-Learning Dean at UW-Extension, has a very entrepreneurial mindset and “his vision for learning includes inventing ways to reach beyond traditional higher education to meet the needs of an increasingly diverse student spectrum”. The CBE programs at UW-Extension were created including a Flexible Option Program and the University Learning Store. UW Flexible Option self-paced, CBE programs allow students to advance at their own pace while the University Learning Store offers competency-based credentials in non-degree programs using authentic assessments that can be completed in days or weeks rather than years but at the same time these credentials are stackable. UW-Extension’s Flexible Option program was designed from the ground up to be a competency-based program with using open technology. This gave program architects some additional flexibility to choose technologies that would support the vision of the program. Andrea Deau, Information Technology Director at UW-Extension, says creating the platform through IMS Global Learning Consortium’s open interoperability standards and ongoing collaboration with IMS members was important to be able to award the credentials and make the program affordable, portable and discoverable. Through membership in IMS Global Learning Consortium, a nonprofit collaborative focused on improving the interoperability of the edtech ecosystem to improve user experiences and learning, Deau has been able to work with like-minded organizations and individuals in workgroups and innovative leadership networks to exchange ideas and learn best practices. IMS Global has been very active in competency-based education in many areas. IMS Global’s upcoming standards, Extended Transcript, and Open Badges version 2.0, have played important parts in the development of both programs. UW-Extension has been a leader in the competency-based education work at IMS. Open Badges are information-rich visual representations of verifiable achievements earned by recipients and are a vital component of the digital credentials ecosystem. IMS Global is responsible for managing and advancing the Open Badges specification. The vision for Extended Transcript is transformative in its potential, beyond providing relevant student competencies and skills. Based on the IMS Digital Credentialing work and leveraging the Open Badges standard and those of the W3C, the vision for Extended Transcript is a secure, student-centered digital record for the 21st century. This prototype is an example of a modern, web-based extended transcript, flexible enough to support the descriptive nature of competency reporting and targets the needs of learners, registrars, and employers. Choosing which degrees are offered within the Flexible Option program was and is the result of market research. Students asked for a business degree often because they have prior related knowledge. This novel program allows students to progress through the coursework at their own pace. In fact, even the tuition system is different; it’s subscription-based. Students pay a flat rate for three months and can complete as much learning as they can during that time; then renew for the next three month period. Deau points out that the profile of a successful student in this program is one who can learn independently and that is self-motivated; however, each student does have an Academic Success Coach to help ensure success. The coach is a point of contact throughout the time a student matriculates through the program while also serving as a guide, support, and advisor. Faculty have learned some important lessons as this program has been implemented. When students are moving at their own pace through the learning, the turn-around time for grading an assessment or responding to a question becomes critical. Deau observes that faculty have risen to the challenge and the faculty who have embraced the program and are currently participating are the innovators who help create the processes for other faculty members as they are convinced to join. The University Learning Store offers modular competency-based learning opportunities in which students can demonstrate mastery and then show the results to an employer. One of the most important features of this program is the portability and discoverability of the skills of the learners in ways not traditionally possible. This program hopes to have verified employers come to the Learning Store looking for employees with specific skills and search a repository to find potential candidates with matching skills. It’s also important to note that the University Learning Store is a collaboration among several universities and colleges including Georgia Institute of Technology; University of California, Davis; University of California, Irvine; UCLA Extension, and the University of Washington Continuum College, also members of IMS Global. IMS Global, closely following the developing registrar guidance of the American Association of Collegiate Registrars and Admissions Officers (AACRAO), is leading the prototype development of an extended transcript (eT) designed to support exactly this sort of competency-based program. Deau explains, “The Learning Store’s is still an evolving project; however, there are already successes to mention including the agile approach to development that is allowing for a continually evolving system as well as working with Lumina Foundation, AACRAO and National Association of Student Personnel Administrators (NASPA) to develop a prototype eTranscript based on IMS standards.” The goal of the project has been to learn and develop a prototype small pilot and Deau reports it has been a very successful learning effort. In just the past week, the program launched a print version of the transcript. While the Learning Store is in publicly available, Deau notes that not much marketing has been done to date. There were conversations early on with Wisconsin employers to flesh out ideas and now smaller, regional employers will need to determine how to use, produce models and get consensus on badges and build off of each small step forward. In terms of accreditation, these new programs are having a small impact. UW-Extension is rethinking how to represent data and being able to translate badges and micro-credentials into courses and credits. Deau shares, “there are probably more questions about financial aid because we are offering these ‘non-standard’ options.” The federal government’s financial aid system is not as modern as it could be. It can be challenging to experiment with programs when it is necessary to translate from informal to formal learning. What might be next for the competency-based education programs at the University of Wisconsin Extension? Andrea Deau indicates a meaningful way to conduct a degree audit would be powerful. A degree audit is an individualized report that reflects a student’s potential progress toward a degree. It compares the student’s coursework (or badges) with the academic degree program and then prepares a report detailing what else would be needed to meet the requirements for that degree. Thus articulating how a student has acquired skills as demonstrated in badges and equating that as progress towards a degree is an essential next step on UW-Extension’s goal to broaden the reach of the university to all, even the non-traditional degree-earner.